Electricity has long been a popular healer. In the 18th century, upper class people in the United States and Europe attended dramatic electrical performances as entertainment. The therapeutic uses of electricity were not just for the elite, however, extending all the way down to the lower classes. The discovery of the Leyden jar – a way of storing up static electricity – in the 18th century allowed shocks to be delivered in a more forceful way. Soon after, Italian physician and scientist Luigi Galvani’s experiments activating the nerves in the legs of a dead frog seemed to suggest that electricity and life were intimately connected. If electricity restored life, suddenly, toothaches, back pain, headaches – just about any ailment seemed like it could be cured by the application of electricity. It ignited an electrical healing craze. Mary Shelley used this belief in electricity to her advantage in 1817, giving birth to Frankenstein. Electrotherapies were common in the 19th century. All sorts of electric devices – electric baths, electric belts, electric vests, electric soap, even electric hair brushes – could be purchased along with wild claims to health improvement. 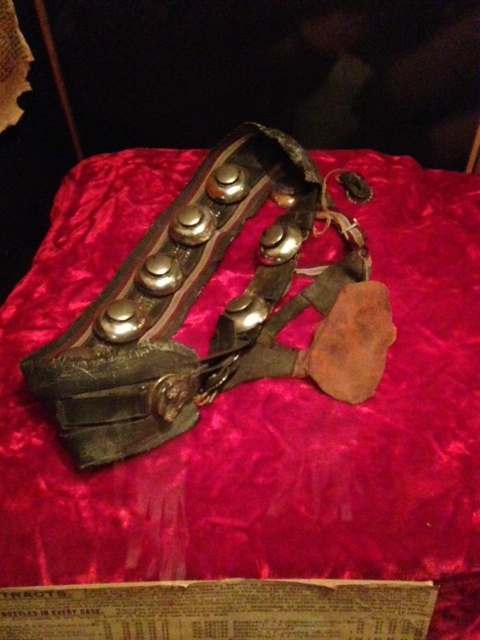 Electric belts were particularly popular in the late 19th and early 20th centuries. Ads featured all manner of testimonials from satisfied customers. You didn’t even have to seek a specialist to get one – they could be purchased from the Sears catalog. The Reinhardt brothers of Milwaukee were big proponents of electrical healing, selling their devices as cures for every kind of sexual dysfunction imaginable. 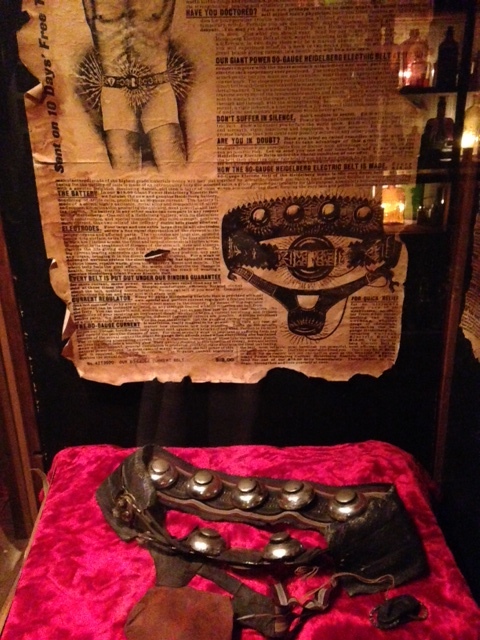 I spotted these electrical belts in the collections at House on the Rock. Of course, electrical therapy still exists to this day. Transcutaneous Electrical Nerve Stimulation, or TENS, for instance, uses a low-voltage electrical current for pain relief, not unlike the torpedo fish of Roman times. Electricity may not be a cure-all but it’s definitely still with us. Long before Carrie, Miranda, Samantha, and Charlotte brought singledom to the television, real women known as “bachelor girls” were doing the same in American cities. In the 19th and early 20th centuries, women were expected to marry. They had no social identity without marriage and motherhood. But in the late 19th century, some single women with respectable ways of earning money came to regard marriage as unnecessary for self respect or financial stability. They didn’t oppose marriage but set certain standards for suitors to meet to gain their hand. “A great many bachelor maids are not living alone because they so choose, but have been unable to find a suitable companion,” declared Helen Gould, a self-proclaimed bachelor maid. 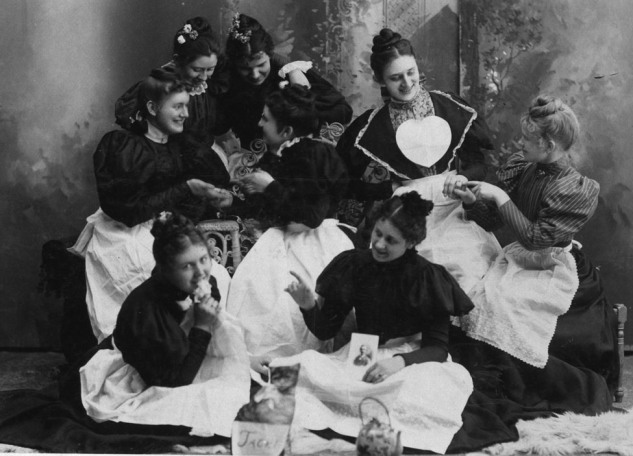 Women like Gould formed social groups, known as Bachelor Maids’ Clubs, first in New York and Washington D.C., and then in cities and towns around the country. Sixty women, “banded together by an ‘all-for-one-and-one-for-all’ compact that would make the Musketeers themselves pale with envy,” formed the inaugural membership of the New York Bachelor Girls’ Club. The women first considered calling themselves “The Old Maids’ Club” but the bad feelings associated with spinsters – “corkscrew curls and a tabby cat” proclaimed one bachelor girl – led them to embrace bachelorhood. The generations of women born between 1865 and 1895 had the highest proportion of single women in history. Before this time, a single woman who didn’t have to work to support herself would likely have resigned herself to a boring life in her childhood home with her parents. Not these ladies. Instead, they pursued higher education, fulfilling work, and independent living. In the late 19th and early 20th centuries, some of the most visible and influential women in the United States were unmarried: Susan B. Anthony, leader of the suffrage movement, Frances Willard, president of the WCTU, and Jane Addams of Hull House in Chicago. Reformers and progressives often cast independent women as the vanguard of women’s struggle for equality. Even though most bachelor girls would end up at the altar, their existence and that of the newspaper column show that views of women were beginning to shift in the early 20th century. Single women now had options, and they dared to reach out to claim them. It was the summer of the ice bucket challenge. Dumping icy water (or just ice. Or just ice to make a stiff drink) on your head to raise awareness for ALS while challenging others to follow suit. One hundred and fifty years ago, people poured ice cold water on their head or bathed in it as a medical treatment itself. Hydropathy, or the water cure, promoted the benefits of pure cold water to good health. Many people took the cure at any number of water cures that opened around the country in the 1840s and 1850s. Most cures were located in beautiful spots alongside streams, lakes, or beside mountains. But the best time to come wasn’t summer but winter when the water was colder and the breezes strong and chilling. Water cures often advertised their winter amenities to people looking to be well. Hydropathy’s founder Vincenz Priessnitz maintained that the water “cannot be at too low a temperature.” The “lower the temperature,” he claimed, “the more efficacious it will prove.” As a result, many water cures charged more in the winter than for a summer visit. Unsurprisingly, winter brought its own hazards to those taking the cures. Icicles sometimes formed around the head of the outdoor shower, sending icy daggers along with cold water down on the head of the patient below. Outdoor bathers sometimes found themselves floating beside chunks of ice. As a kid, I loved Laura Ingalls Wilder and her “Little House” books. Every time it snowed (rare in Seattle), I’d imagine opening the front door to find a wall of snow like in The Long Winter. Or tying a rope from the house to the barn to find my way in a blizzard (not that we had a barn in the suburbs). When the power went out (a much more common occurrence), my parents and I would huddle near the gas fireplace. Though we never had to close off the upstairs of our house for the winter, I was ready if it became necessary. I read the books so often as a child that the characters felt like members of my own family. I imagined living in Laura’s time as well as showing Laura my life should she ever come to the present for a visit. Although its been years since I’ve read the books, I couldn’t resist a stop in De Smet, South Dakota, otherwise known as the Little Town on the Prairie. De Smet is the setting for five of Wilder’s Little House books. Pa Ingalls brought his family there in 1879. This part of South Dakota is marked by small rolling hills and glacial lakes under an enormous sky. 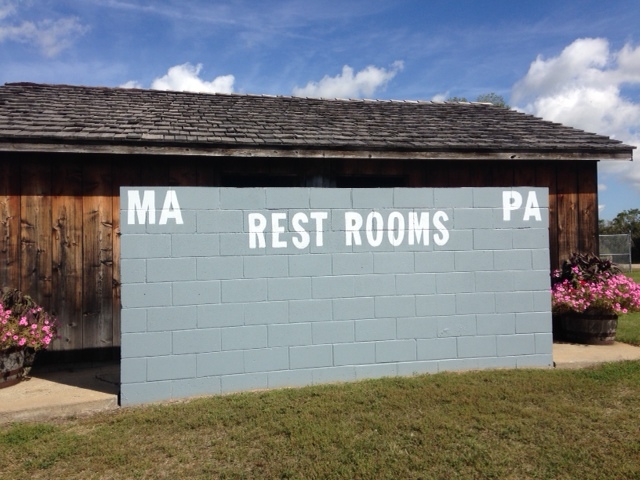 The whole town is given over to Wilder mania… even the public restrooms. 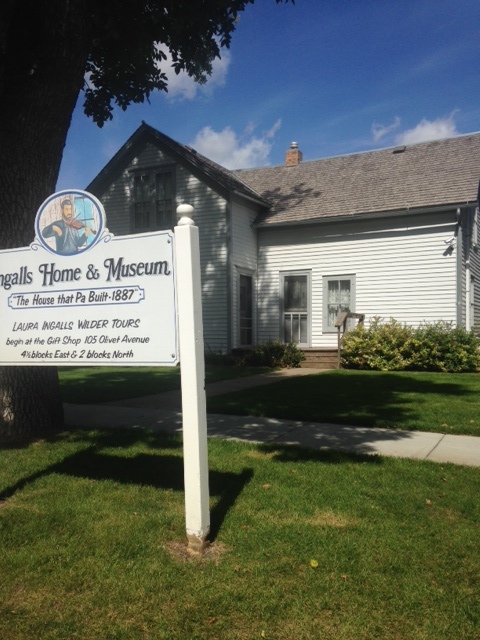 The two existing Ingalls homes are owned by the Laura Ingalls Wilder Memorial Association. There’s the Surveyors’ House, which was originally located on Silver Lake (Wilder wrote about it in By the Shores of Silver Lake), where the family lived for five months before moving to their own homestead. Down the street is the original Ingalls’ house that Pa built in 1887. Its a small white two-story frame house just a few blocks from what is today De Smet’s main street. Some of the buildings featured in Wilder’s books still stand in the quiet town, including the Loftus Store and Banker Ruth’s house. On a warm and sunny September day, De Smet’s streets are quiet. The few people we pass smile and nod at us, surely knowing we are there for Laura Ingalls Wilder. Just outside De Smet is the Ingalls homestead where reproductions of buildings described by Wilder dot the spacious prairie grass. The 1862 Homestead Act provided that any citizen could claim 160 acres of surveyed government land. Claimants had to “improve” the plot by building a dwelling and cultivating the land. After five years, the land was given to the original claimant for only a small registration fee. Pa Ingalls staked his claim and moved the family out to their new farm. 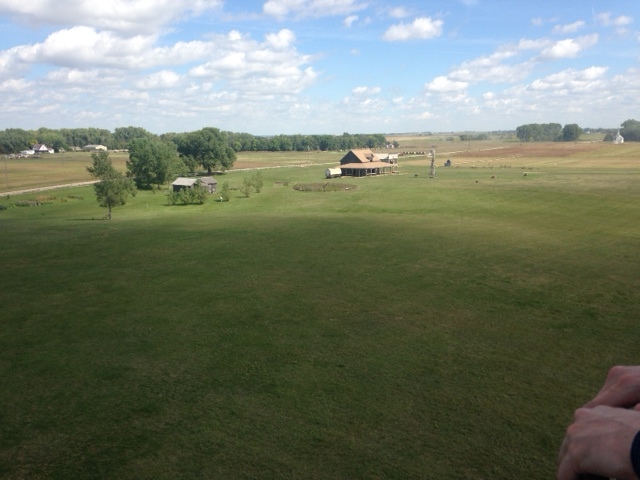 The land has passed through many hands since the Ingalls family lived there. I was far less interested in the recreated buildings than in seeing the landscape with my own eyes. Even many years removed from reading the books, I could still see the mental picture of the Ingalls’ life that I had created so long ago. It really is a beautiful place and seeing it in person (something I still can’t quite believe I really just did! ), I can imagine why Pa had so much hope for this promising piece of land after so many years of hardship. We all know that an “apple a day keeps the doctor away.” Apples are filled with healthy vitamins and fiber – the perfect healthy snack. But this is a relatively new idea. For centuries, eating a raw apple was seen as a reason to call FOR a doctor. People throughout Europe and North America were suspicious of apples and raw fruit in general. In medieval Europe, apples were banned for children and wet nurses. An upset stomach or flu nearly always resulted in fingers pointing at the poor, humble apple. It didn’t help that many believed the apple the cause of Eve’s downfall in the Garden of Eden. At the same time, apples found a welcome home in the medicine cabinet, prescribed for all manner of aches and pains. It’s funny that an apple could both cause disease and cure it. Part of the unease with apples had to do with the apples that many people were eating. The Romans had cultivated extensive orchards and seemed to know everything there was to know about apples. But when Rome fell, that knowledge mostly disappeared (or in many cases, went behind monastery walls where monks practiced orcharding techniques aiming for self-sufficiency), leaving people with the often bitter wild apples. They tasted so bad that many people came to believe that apples were poisonous. Fruits sold in villages and city markets were often unripe, overripe, or contaminated so apples weren’t all that appealing. Apples were wildly popular in alcoholic form, however. Cider was the drink of choice in England, France, Spain, and the United States. The Temperance movement in the 19th century ruined cider’s reputation and by extension, that of the apple as well. In an effort to rehabilitate the apple’s image, the apple industry began marketing apples as healthy foods for actual eating and not just drinking. Missouri fruit specialist J.T. Stinson coined the phrase “an apple a day keeps the doctor away” at the 1904 St. Louis World’s Fair, an association apples have benefitted from ever since. 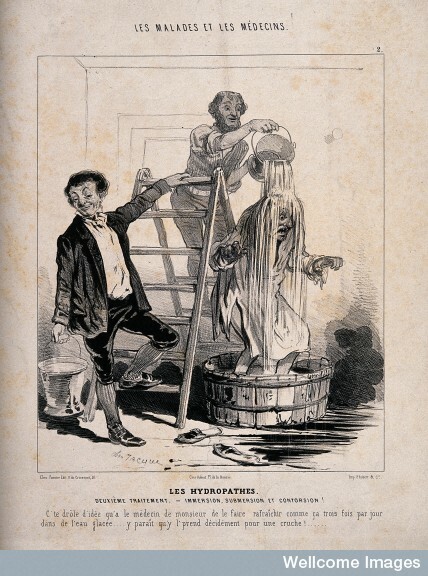 Hydropathy, or the water cure, was hugely popular in the 19th century. And as such, people of all kinds – well meaning and otherwise – developed a panoply of devices and contraptions to help people wash out disease with cold, pure water. The bath, manufactured by the “Jersey” Co. (not sure about those parenthesis in the name – were they trying to hide something? ),gave users the agitating sensation of the sea, an experience meant to replicate a visit to a real water cure where patients took all manner of baths, water wraps, and showers. Visiting a water cure was expensive. A week’s stay could cost $10, which was more than the average American earning a$1 a day in the mid-19th century could afford. But water cure practitioners wanted to make sure their cure was affordable and accessible to all so they published reams of books and articles offering advice on home treatments. Any able bodied person could do it, they claimed. And judging by the letters in the main hydropathy magazine, the Water-Cure Journal, many people did and found relief. 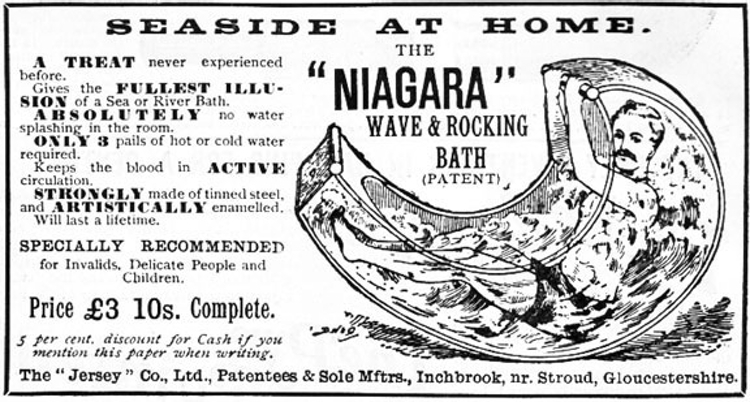 The makers of the rocking bath hoped their product would help make home treatment even easier. It “will delight and benefit, especially invalids, delicate people and children” read one article. The back could even be wedged into an upright position to serve as a regular tub if no rocking was desired. 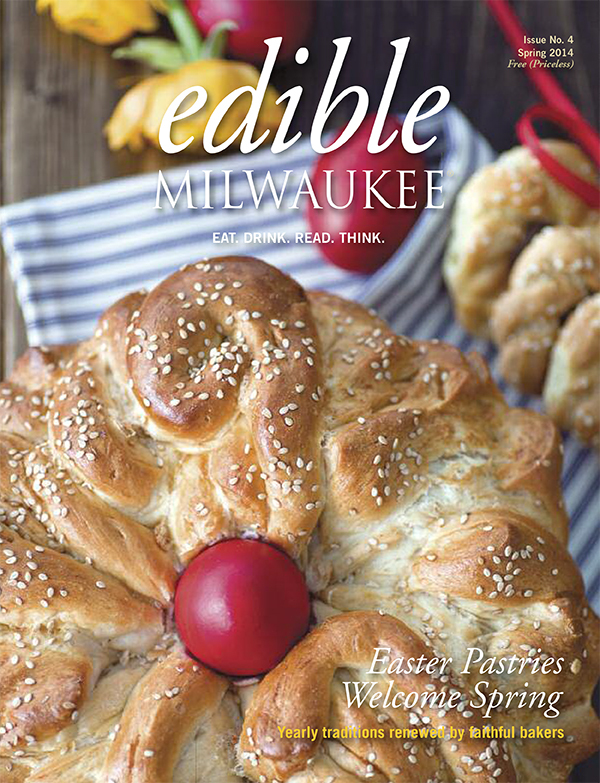 My latest story for Edible Milwaukee is out in the summer issue. It’s all about some of the local growers trying to revive the state’s hop and barley tradition. Let’s just say I jumped at the chance to explore Wisconsin beer, past and present. I remember the first time I saw hops growing at the truly wonderful Farmers’ Museum in Cooperstown, New York. 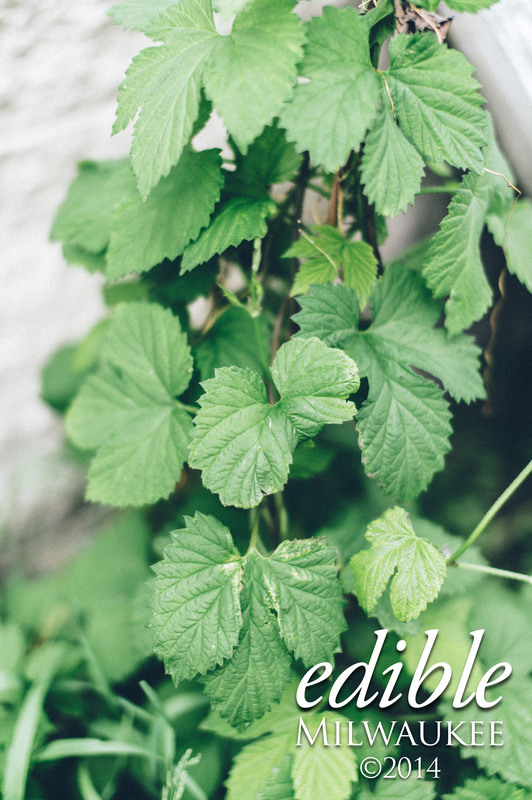 It was actually the hops that led me there – I saw them climbing up the poles in one of the gardens and just had to get out to see what in the world was growing in there! I’ve since been to the American Hop Museum in eastern Washington so hops in their pre-beer state are no longer foreign to me. But I still thrill at the sight of them. There’s something magical about the vines and flowers. I learned a lot telling this story (I won’t spoil it by telling you everything before you can even read it – something I tend to do to my husband all the time) but one of the things that sticks with me is something brewmaster Grant Pauly from 3 Sheeps Brewing in Sheboygan told me. Wisconsin’s long brewing history isn’t just about the beer. It’s also about the equipment to make that beer and that the state’s long brewing history means that many of the things needed to make and sell beer commercially – from the tap handles to the cardboard six-pack holders – can be sourced from local businesses. It makes perfect sense but had never before occurred to me. Long before Wisconsin became America’s Dairyland, Wisconsin brewed beer. The state had barley, wheat, ice, and water. It had hops. And most important of all, a beer-thirsty people called Wisconsin home. So thirsty that in 1839, German settlers in Milwaukee, desperate for a taste of home, mixed whiskey and vinegar with a little limestone to create a head that they called “Essig whiskey heimer” (something like homemade vinegar whiskey or vinegar whiskey of home). The opening of the city’s first brewery – by a Welshman, not a German, alas – the next year hopefully put an end to that frightening blend. Certain professions just seem to need a uniform of some sort. A doctor’s white coat or scrubs (or both); a postal worker’s blue tops and bottoms; a park ranger in green and/or brown; military personnel. And people in law enforcement, definitely, right? Police officers are actually the first people that come to mind when I think of jobs with uniforms. And yet uniforms were surprisingly controversial and considered absolutely unnecessary for early female officers. Police uniforms ignited fierce controversy in the United States and became a convenient point of attack for those opposed to the creation of municipal law enforcement (also a surprisingly large bunch). Freedom of dress fell high on the list of cherished American values. For many Americans, uniforms smacked of British pretension and elitism. The only people who wore uniforms on American streets were soldiers and servants, both symbols of values that democratic Americans generally opposed: standing armies and wealthy elites. Demonstrating in front of the home of the New York City chief of police in 1854, city officers claimed that uniforms “conflicted with their notions of independence and self-respect.” Others decried the great expense of the public’s money to outfit a local army. In Philadelphia, city councilmen denounced the uniforms as a “badge of servitude” after fifteen officers resigned in protest, refusing to wear even a hat. City officials argued that uniforms made police officers visible and accessible to the public. Perhaps more importantly, though, uniforms made officers easier for their supervisors to track. Without a uniform, officers could easily take their badges off and blend in to a crowd. Police captains struggled to maintain control over their officers on patrol. How could they know whether an officer was actually working and what standards they were enforcing? Without telephones, two-way radios, and other communication technologies, uniforms became one imperfect way to keep track of patrolmen who devised ingenuous methods to thwart supervision. The Civil War helped to elevate the status of uniforms among the public and police, and after the war, the blue coat became fairly standard police attire. Discussions regarding uniforms for women dragged on and on. 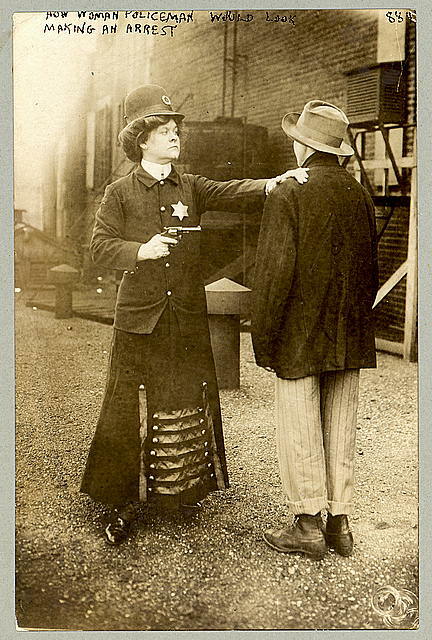 Women first entered policing in larger numbers (still small, though) in the early 20th century. Political leaders and many policewomen themselves as well saw no need for an official uniform, preferring instead that female officers pin their official badge to their clothes. Early policewomen engaged primarily in protective work, safeguarding the morals of women and children. Some departments had ceremonial uniforms for policewomen. In Los Angeles in the 1920s, policewomen wore white dresses similar to that of a nurse. New York City police officer Mary Hamilton believed the lack of uniform gave women an advantage because it allowed them to “mingle with the crowd without arousing suspicion and thereby [women could] detect conditions that would never exist while a bluecoat were in sight.” Policewomen were supposed to intercede in families and on streets without bringing a lot of attention to themselves or the suspect. Many female officers believed the experience of being arrested was humiliating enough without having to call more attention to it with a uniform. Women went decades into the 20th century without an official uniform. And sometimes, when uniforms were created, the chosen styles clashed with the job – mini skirts and high heels, despite what we see on TV, are probably not the best crime fighting style.